The present sage of a president without a hometown is on the nose already. Former President Barack Obama remains in Washington, while tradition dictates that former presidents go home after their time is done. It has been many decades since a former president didn’t gleefully escape the pressures of Washington. For Obama, the spotlight and the adoration are his life. He has an army of agitators, some say around 30,000. Their mission is to fight his Republican successor at every turn while he commands from his rented mansion located within two miles of Trump’s White House. It is fortified with a tall brick perimeter and a nearby taxpayer-funded office with his own chief of staff and press secretary. Michelle Obama will also open an office there, along with the Obama Foundation. To Obama and his supporters, the election never ended. Oh, their side lost, but to them it was nothing more than an aberration. Deplorable Americans didn’t know what they were doing and these arrogant rabble-grousers are here to remind us just how ignorant we are. Yes, it will be an unusual post-presidency. Unlike the classy exit of former President George W. Bush after enduring months of political bashing at its highest degree by Obama, he went back to Texas. But for the next eight years of Obama’s failed presidency, Bush was the target for those many failures that occurred. From the economy to foreign policy, Obama blamed it all on Bush to the bitter end. 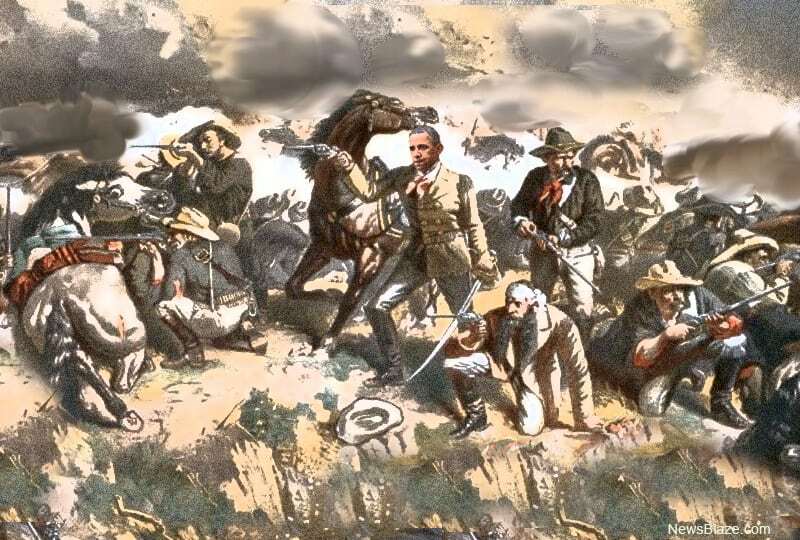 Obama’s last stand, after Custer’s Last Rally lithograph. There has been no talk among Obama’s smug followers or their compliant media buddies about those failures. No one speaks of the stunning loss as a derivative of Obama’s unsuccessful presidency. Not even a whisper that under his watch the Democrats lost the House in 2010, the Senate in 2014 and the presidency in 2016. No, that is an irrelevant set of facts and facts are not what his minions of loud-mouthed anarchists want to hear. There is no clue about the demise of the left. While Elizabeth Warren rambles on and on about the great Satan Republicans, the country has moved on. They made their decision last November, and not unlike spoiled children who will not obey their elders, the left persists in squeezing into the national scene they were abjectly voted out of. He is working through the so-called network of leftist nonprofits led by Organizing for Action. You would expect such an organization while a president was in power, but not Obama’s OFA. Rather, it’s gearing up for battle, with a growing war chest and more than 250 offices across the country. The question is, what did he accomplish? The organization is run by old Obama aides and campaign workers, federal tax records show “nonpartisan” OFA marshals 32,525 volunteers nationwide. Registered as a 501(c)(4), it doesn’t have to disclose its donors, but they’ve been generous. OFA has raised more than $40 million in contributions and grants since evolving from Obama’s campaign organization Obama for America in 2013.
Who Is The Miserable Failure Now? This is Obama’s real legacy. It is the arrogance of a man who practically single-handedly destroyed the Democratic Party. A man now responsible for the Republicans holding both Houses of Congress, the presidency, the next two to three Supreme Court Justices and all federal judgeships for at least the next four years. That is not to mention 31 of the state governorships and a majority of state legislators. This is the man the Democrats look to for the future of their party? The question for the Democrats is this: Are you ready to go with him? Something to think about long and hard as you are fast becoming a regional political party.